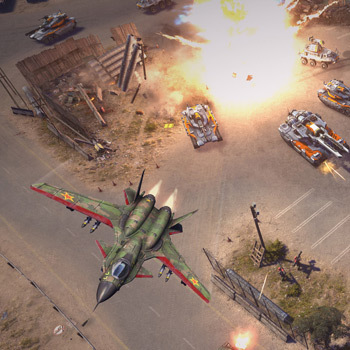 Electronic Arts abruptly cancels its unreleased Command & Conquer sequel. Electronic Arts has pulled the plug on a Command & Conquer sequel that was scheduled for release this holiday season. The game, which was being developed by Victory Games, entered an alpha testing phase several months ago, and EA has not been pleased with the results. "Your feedback from the alpha trial is clear: We are not making the game you want to play," reads a post on the official Command & Conquer website. "That is why, after much difficult deliberation, we have decided to cease production of this version of the game. Although we deeply respect the great work done by our talented team, ultimately it's about getting you the game you expect and deserve." Unfortunately, this cancelation is going to be rough for the people at Victory Games. "This does mean that the Victory Games team will be disbanded," an EA representative told Game Informer. "Wherever possible, we are working to help these talented people find other opportunities with EA." Command & Conquer has always been an important franchise for Electronic Arts, so I'm sure we'll eventually see another sequel. In fact, the publisher has "already begun looking at a number of alternatives to get the game back on track." In the mean time, I may have to reinstall Windows 98, so I can replay Tiberian Sun.